Below are a couple of pics of my recently acquired 1986 "Miami Vice" Centurion Ironman Expert. It is a 53. Yes, there is a lot of seatpost, but all of my bikes have a lot of seatpost. With my build (long legs, short torso, long arms) it is a fun ride and comfortable in the drops. Nonetheless, this is as small as I'm going to go. Great for riding laps around the Air Park at sunset. "Miami Vice" colors, though. A more staid red\white fade. A mix of Tange #1\#2 and Shimano 105 group with Wolber rims. I only guessed 1986 and really don't know that much about this model. Any background would be great. One of my all-time favorite production paint jobs (the smoky purple fade on my '88 Ironman comes in close second). ...but damn! saddle to bar drop. You must be super aero on this bike. beautiful pic with the Flowers and the wooden door. With such a long stem and such a high seat post I'd think you could go at least a frame size bigger and simply use a more average length stem and lower the seat...of course you'd lose that wicked Saddle to Bar drop. Do you ride Tri on this? I think you are right about size, however, in the C&V world it is good to be "flexible." Nice bike. When the tires wear out, add some with the yellow. I'd say you can ride a 56cm no problem, but if this fits and you like it, ride it. 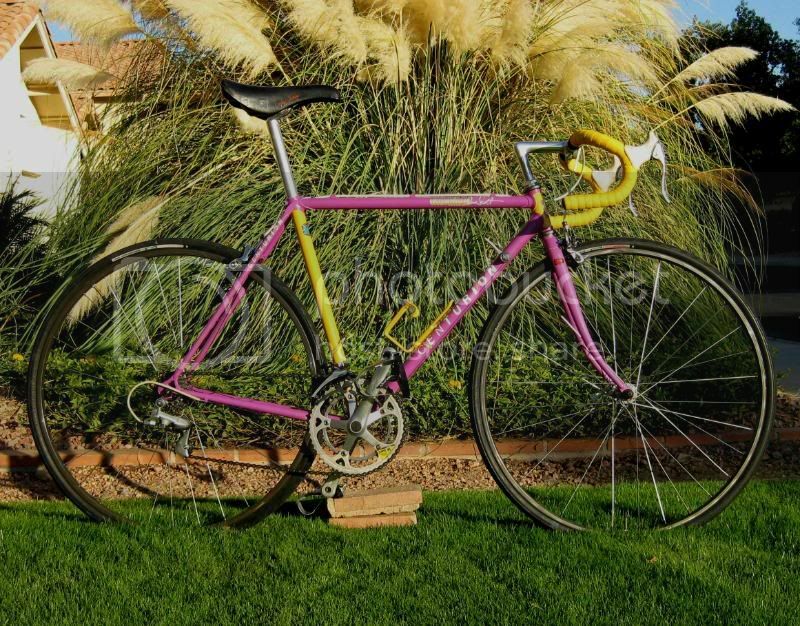 Looks like a nice candidate for a vintage tri-bike, too. That's top506's favorite bike color, too. Robbie, you are right. My sweet spot is a 55 TT. I am particularly fond of the old Crit bikes with long seat tubes and short top tubes (i.e., 57/55). Do not mock me in my affliction! I think this is a color scheme that you either love or hate. For me, this combination is almost an icon of the era. I even had ties in these colors. Also, at sunset, the colors glow and make it look like a cartoon bike. ......, at sunset, the colors glow and make it look like a cartoon bike. So next time you go down a hill, yell "yabba dabba doo!" 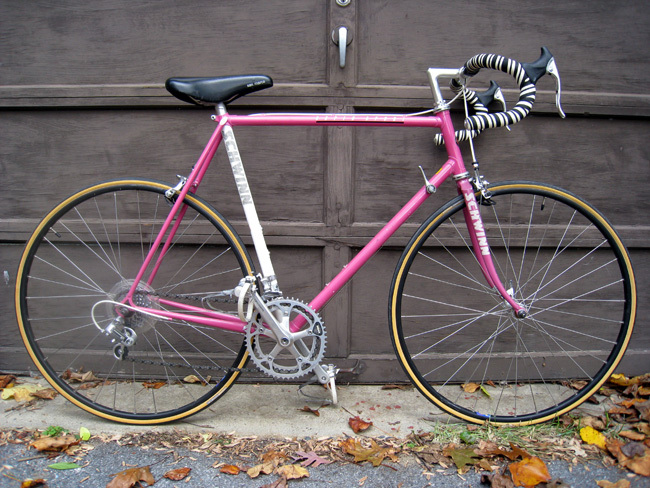 I have the same Centurion, except mine's a 60cm with all Shimano 600. Gotta love that BIOPACE. 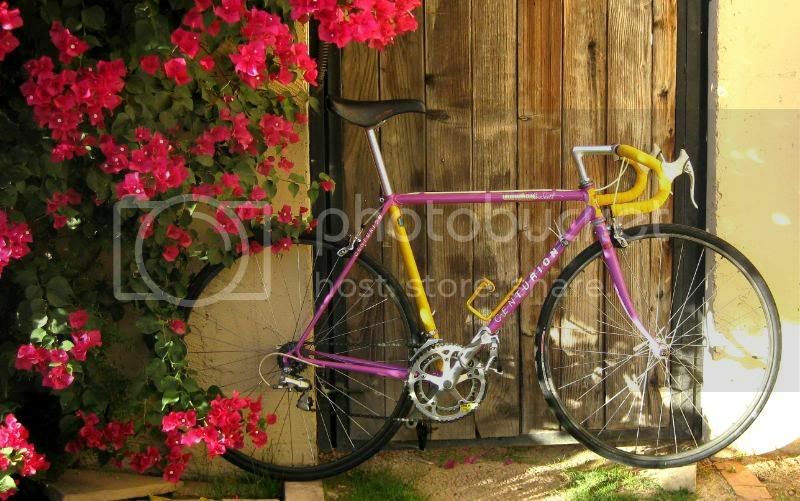 any other magenta bikes out there from that era? Awesome bike! I'll date myself: I remember when these bad boys were new. A LBS in Augusta GA carried them and I used to always drool over them. Indeed the "tri" look of the era mandated the awesome colour schemes! Well I ended up getting a TREK 560EX PRO and yes, it is Shimano 600EX equipped including the Biopace chainrings. I still have it too although mine does not have the cool colour combination. My father bought that bike new in Santa Barbara. After a few rides, the Centurion was left to die in the forest behind his house. There it sat for almost twenty years, until I found it- still leaned against a tree, covered in leaves and muck. I cleaned it up and upgraded all the 105 to 600. It is still my favorite bike of all time. Last edited by gh-ap; 11-19-09 at 11:28 PM. Nice Centurion! I often see one in the bike rack at Safeway (think it's an employee's) in yellow and white. They have beautiful lugged frames.